If you’ve been following us on Facebook or Twitter, you’ve seen that The Good Jobs website went live in preparation for our formal launch. We have timed our official company launch with the first day of spring…and we couldn’t be more excited. If you haven’t RSVPd for our launch party yet, there’s still time! Join us! To kick off The Good Jobs “officially,” here’s an intro all about us! What we’re all about…what we stand for…and what we plan to accomplish!! 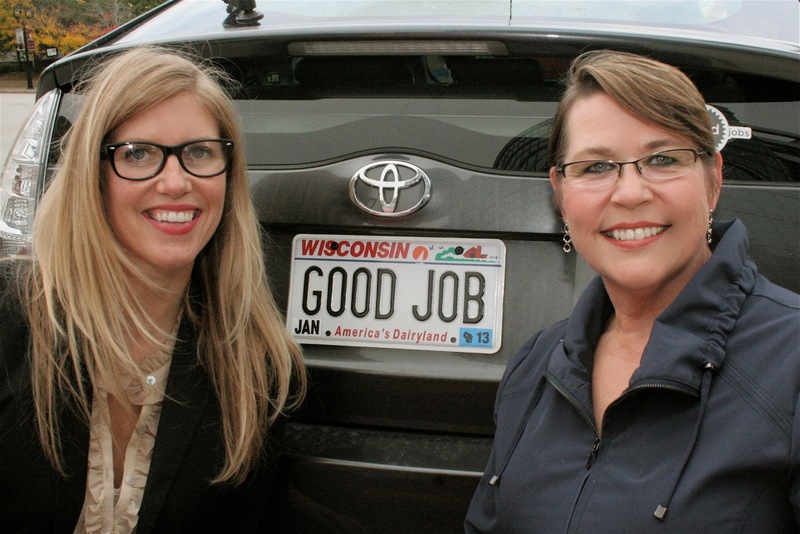 We are the co-founders: Anne Nimke and Betsy Rowbottom. We’re HR and recruiting veterans who understand how important culture and employment brand are to both companies and job seekers. During an easy evening conversation we started talking about work and life balance. The chat turned to how more and more job seekers are frustrated with a lack of information to help them find a job that aligns with their ideals and values. Right then and there, The Good Jobs was born. Job postings surely don’t provide that information, and most company websites don’t either! Here we are today — The Good Jobs has come a long way since the idea we developed that night…on a napkin! Anne has successfully co-founded several companies during her HR/Recruiting career, including Pinstripe and HRfirst (now Kelly OCG). She has also served at the executive level for several organizations, including ProStaff and Olsten Staffing Services. Anne began her career as an HR Practitioner at Miller Brewing Company. She’s a proud single Mom of three and is involved with a range of professional and charitable organizations across the Greater Milwaukee area. Betsy is an experienced professional in RPO (recruitment process outsourcing), having previously worked with Anne at Pinstripe. Her sales and marketing background makes Betsy the right person to help lead The Good Jobs through this kickoff and beyond! Betsy has also served as personnel director for the Telluride Film Festival, and spent several years as director of sales at eStara, a VOIP provider. She is very active in the Startup community and is proud to be a Big Sister. We think we’ve got just the right combination of experience, savvy and gumption to launch The Good Jobs! The Good Jobs is a marketing platform that helps companies find top talent by leveraging their corporate culture and employment brand. The Good Jobs is the only Company Culture Directory, offering potential employees the opportunity to see in detail a description of an employer’s brand and culture. The Good Jobs’ proprietary Badges create a common culture language that enhances every marketing and communication channel, turning their culture into a competitive advantage. 2) Got you excited about the company? A job posting that showed you that this company aligned with your values, offered the unique perks and schedule you were looking for in your next job? The number is low to none, right? Not even the postings from your own company. Many of today’s companies are simply not leveraging their brand to connect with the talent they need. As we built The Good Jobs, we knew that there are companies with wonderful cultures out there… they just aren’t marketing themselves effectively! We created The Good Jobs to provide a way for companies to tell their unique stories and leverage their brand to connect with discerning candidates. You know – not the desperate job seeker, but talented individuals in any job category who are careful about the companies they join and want to integrate their lifestyle and their work style at the next job they take. We Questionnaire – Not sure of what your company’s culture or brand is? You have a unique story – every company does! Take a 2-minute survey and we’ll help you prioritize the most important components of what makes your company special. Badges – The Good Jobs Badges provide a visual, easy-to-understand (and use!) way to showcase the unique qualities and benefits your company offers. Our Badge Applications help you identify and consolidate all the great programs, activities, and amenities you currently offer your employees. Many of our customers have found our Badge Applications a useful exercise and tool for the future. From flexible work arrangements to a commitment to being earth-friendly, our Badges showcase what makes your company special! Culture Directory – Allow candidates to see your Badges and understand all that is special and unique about your company – quickly and efficiently. Our Culture Directory lets you see how you stack up, and lets candidates see what a good company you are. Enhance your current recruitment marketing – Once you’ve earned your Good Jobs Badges and have completed your Company Profile you can use your Badges in all the channels you recruit…job postings, social media, candidate emails, newsletters…and even on your career site. You now have a way to leverage your employment brand and your culture to secure those talented people you’re hoping to hire. There you have it – an introduction to The Good Jobs. You can always find more information over on our website, or even through our social profiles. And of course you can always reach out to us with your comments and questions. We are excited to start a transformation in how companies and talent connect. So while spring has sprung and The Good Jobs has launched, we are truly just getting started – thanks for coming along for the ride with us! naturally like your web site however you have to check the spelling on quite a few of your posts. Several of them are rife with spelling issues and I in finding it very bothersome to inform the reality then again I�ll definitely come back again.